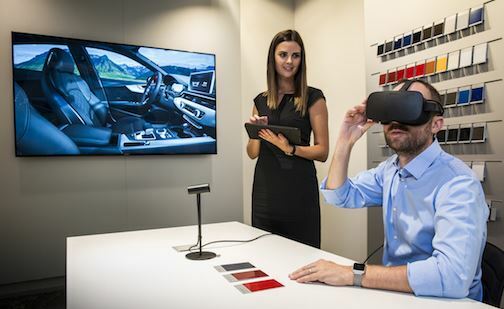 Audi has announced the launch of the Audi VR experience – the first fully functional virtual reality application for customer consultation at dealerships. The programme will initially be rolled out to dealers in Germany, then the United Kingdom and Spain with more locations to follow. The VR solution allows customers an extremely realistic experience of their individually configured car, down to the last detail. It also explains Audi technologies intuitively and offers customers the opportunity to immerse themselves virtually in extraordinary moments from the world of the four rings. As part of Audi’s comprehensive initiative for digital innovation at dealerships, the VR experience is completely integrated into the brand’s IT systems. Digital technologies such as the VR headset allow dealers to present the entire Audi model range, including all equipment options, during the customer dialogue. More than 400 “Customer Private Lounges” – a digitalised consulting suite – are already in use. With the VR headset, prospective buyers can configure their individual dream car and explore even the smallest details from a realistic perspective, selecting from several hundred million possible models and equipment variants. The VR application allows users to become completely immersed in the virtual world, conveying an all-encompassing, detailed image prior to the purchase decision. The configured Audi is experienced in three dimensions and 360 degrees, with all light and sound effects. Various environments, times of day, and light conditions also contribute to the true-to-life virtual experience of sitting in the car. The interior can also be observed from every perspective, down to the surface of the decorative inlays, depending on the position relative to the virtual light source. In addition, the so-called “x-ray vision” allows tech-savvy users to take a look beneath the surface of the car, into the structure of its technical components. Future VR software upgrades will also offer demo features on Audi innovations that can be tested only to a limited extent during a real test drive – such as different light technologies at night and in poor visibility. In most markets, dealerships will run the VR application on the Oculus Rift headset from Audi’s primary project partner Oculus. To allow the complex data models to be processed for virtual reality, Audi worked with its strategic visualisation partner Zerolight to develop an especially high-performance graphics engine. Virtual reality is used by Audi in numerous areas of the company – from sales and technical development to automotive production. For example, the company uses VR headsets to train logistics employees for their assignments at the worldwide production plants of the four rings.